Being good DevOps practitioners we know we should build once and deploy many times, but how can we make this work for our front-end applications? First let's just get one approach off the table. Some proponents swear by the commandments laid out in the twelve-factor app and take it as dogma that all configuration for your application should be pulled out of individual environment variables. In my humble opinion, this approach is very limiting for a few reasons. First, this doesn't work easily for browser-based runtimes where you have a static website to serve and need to get that configuration in the browser. Secondly, this adds complexity to your hosting environment, whereby you need to ensure that each process that runs your application has its own collection of environment variables which persist across restarts and doesn't leak across to other instances (for example where your testing VM hosts multiple instances of the same application). Lastly, this may be straight forward when you have just one URL that needs to differ between environments, but in many applications, the configuration may include many different variables, some of which are deeply nested values. Trying to manage and consolidate hierarchical information through environment variables has a bunch of downsides. Ultimately, the 12-factor app solution of not storing config in code and to store it in environment variables instead is a bit of a false dilemma. We know that storing configuration in code is neither the most flexible nor secure way to provide configuration, but it is the proposed alternative. Any good deployment tool should also be capable of providing the environment specific variables needed to run your application in a self-contained manner. Create a simple config.json file that contains the configuration needed for your application. The values in this configuration can just be those you need for development time. There is no need to create a config.staging.json or config.prod.json in your source code, the environmental configuration will be provided by Octopus (or your deployment tool of choice) at deploy time. Avoiding these "environmental" configuration files makes our CD process much more flexible and avoids leaking our infrastructure phases into the source code. At runtime, all our code needs to do is retrieve this config.json file from the server like any other resource. Let's walk through a couple of examples of how this can be achieved. There are many ways that this pattern can be accomplished in whatever framework you are using so you may want to modify the following examples to suit your needs. You couldn't get easier configuration than that if you tried. No need to muck around detecting environments, loading config.prod.json and combining with defaults in config.json or consolidating with environment variables! As you can see, we are importing a config module. This is not the raw JSON file created above. This is a special module I will show below. Since this component will not render until the ConfigLoader component has loaded the config.json file, we can assume that the config object has all the properties we need, in this case just message. // If we haven't yet loaded the config, show either a "splash" component provided via a `loading` props or return nothing. The great thing about this is that as we are developing we can modify the config file, and Webpack will trigger a refresh as if we were updating any other file. 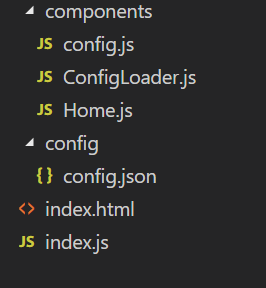 Everywhere in our app that we want to use the configuration (like the Home component above), we can load and simply use the config module and access the properties directly since all modules downwards are only rendered once the ConfigLoader component has retrieved the configuration. Remember that so long as we transform the config.json file as part of our CD pipeline, we will then get the appropriate values supplied and consumed by our application. This is a fairly simple demonstration, and depending on your use case you may want to dispatch the config into a redux store, or you may also want to deal with more complex scenarios like cache busting, etc. Rather than go into too much detail reiterating the same points above for a different framework, I'm going to shamelessly plug another blog post by Pam Loahoud on creating Editable config files for Angular since this essentially follows the same basic premise as the examples provided above. In Pam's example, it boils down to creating a service to retrieve the statically hosted config.json file. I like the added touch in this case of using typescript to provide type checking of the configuration at dev time. Once again, with the single configuration file available in your built package, the key is to let your deployment tool perform the appropriate configuration replacements and transforms.